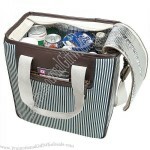 This 33-can capacity fashion cooler features a navy and white stripe design on 14 oz. cotton canvas with leatherette trim. The main compartment has a foil upper and heat-sealed PEVA lining, dual zippers with leatherette pull straps and a hook & loop closure. The 46-1/2" removable and adjustable shoulder strap has trigger swivel clasps and the cotton handles have a leatherette snap attachment. Other highlights include antique brass hardware and a fully-lined zippered front pocket.